With a much similar aroma of rich roses, Rose Geranium essential oil is known as the poor people’s Rose oil as it is less expensive than the original Rose essential oil. Botanically known as Pelargonium roseum, this plant belongs to the Geraniaceae plant family and is indigenous to Cape Province, South Africa. Often used as a substitute for Rose essential oil, Rose Geranium oil is extracted from the soft rosy flowers with the touch of deep fuchsia of this perennial shrub. With a smooth, rosy, fresh, warming, herbaceous, purifying and sensual aroma, Rose Geranium oil is known for regenerating female energies and for treating an extensive array of skin problems in Ayurveda, the oldest of all healing practices. Rose Geranium is said to have originated in South Africa along with Egypt, Morocco, Reunion and Madagascar. It was then introduced to the European countries like France, Italy and Spain in the early 17th century. The herb and the essential oil of Rose Geranium has been used in the pre-historic period as a powerful injury healer including cuts, abrasions, burns, skin ulcers and infections. This is attributed to the antiseptic, antibacterial, analgesic and anti-inflammatory properties. The sweet citrus-floral fragrance of this oil made its use prominent in the fragrance industry since the ancient times. A 2009 study on ‘Volatile Components of Pelargonium roseum’ proved that Rose Geranium essential oil contains thirty-two compounds and the major ones among them are citronellol (27.3%), citronellyl formate (17.2%), β-caryophllene (10.3%), limonene, a-pinene, terpenes, myrcene, menthone, geraniol, cetones, ϒ-muurolene, geranyl butyrate, linalool, aldehydes and geranyl acetate. The most significant healing properties are antiseptic, vulnerary, antidepressant, cicatrisant, vermifuge, astringent, styptic, diuretic, deodorant, cytophylactic, haemostatic and tonic. Ayurveda is a traditional Indian healing methodology that means science of life. It is more than just a system of dealing or diagnosing illnesses, it is a common sense science that guides humanity on leading a holistic life preventing illnesses for an enduring bliss. Ayurvedic approaches rely on nature for their treatment and trust that nothing else other than essential oils, herbs, yoga, meditation, balanced living and spiritual oneness can grant optimal wellness to a human’s life. Ayurveda classifies individuals based on their unique constitution that is composed of three basic energy elements namely vata, pitta and kapha doshas. Imbalances of any one of these doshas open door to diseases and interrupts a human’s body’s balance with nature. Vata is the lightest of these 3 doshas and imbalance of vata ends up in insomnia, constipation, PMS, stress, nervousness and fatigue. Pitta being the hottest energy element and when out of balance it causes digestive disorders, anger, emotional distress, high blood pressure and lack of interest. Kapha is the heaviest dosha and its disparity leads to sluggishness, blockage, depression, improper blood circulation, high cholesterol, weak metabolism, depressive thoughts and fluid retention. Ayurvedic texts classify Rose Geranium essential oil as an ideal healing force for pacifying and controlling the imbalances of all the three doshas with its balancing effects. A German based research has clinically proven that the presence of the Geraniol component in Rose Geranium essential oil is very effective in treating autonomic nervous system imbalances known as Vegetative dystony. A balanced autonomic nervous system is highly essential for the normal functioning of the body, mind and its emotions as it influences the production of hormones and the corresponding responses in the system. Imbalance of which can cause nervousness, anxiety, depression, hot flashes, headache and irregular heartbeat. The essential oil of Rose Geranium has a perfect harmonizing effect on the central nervous system, making it idyllic in uplifting the spirits and handling stress. Using 2 drops of this oil in your potpourri or diffuser, in bath or as a massage oil blended with carrier oils like coconut oil transforms positive energy in your body and your atmosphere. This helps greatly in alleviating stress, depression and anxiety at it best. The convincing aromatic molecules present in Rose Geranium oil reach the limbic system through the nasal passages and inculcates a stimulating force in the adrenal cortex. Rose Geranium oil is used in many popular health supplements for body building, athletic performance and weight loss for a fit physique. This is mainly due to the stimulant property of this oil where certain supplement manufacturers claim that the presence of the stimulant component dimethylamylamine in Rose Geranium oil makes it powerful naturally. The University of Wisconsin Steven Point suggests an effectual massage oil blend that contains few drops of Rose Geranium oil with few drops of Lavender essential oil with the base of Almond and Vitamin E oil for relieving muscular tension and grant a relaxing effect on the mind and body. This is what an athlete would essentially require to trigger his/her efforts and chase their passion without any blocks. The regenerative and haemostatic properties of this oil enhances circulation, has positive effects on the functions of liver and spleen, stop hemorrhages and helps in treating blocked menstruation, PMS, hot flashes and mood swings in menopausal women. Using 2 to 3 drops of Rose Geranium essential oil with Sesame oil for massaging your abdomen or added to your warm bathing water helps in regulating the lymphatic system, promoting the release of toxic substances in the body while checking heavy periods and vaginal secretion. This oil is also known to ease labor pain and childbirth. The great news is that Rose Geranium oil benefits all types of skin including dry, oily, sensitive and normal skin. 2 drops of Rose Geranium oil blended with 2 drops of Lavender oil along with soothing carrier oil like jojoba oil applied on the affected area aids in reducing dryness, sting, itching and peeling of skin due to severe sunburns. Adding few drops of Rose Geranium oil in your skin care cream or lotion helps in controlling the excess secretion of sebum responsible for acne and dull oily skin. It balances the skin naturally, treats congestion, sluggishness and leaves your skin supple and healthy. 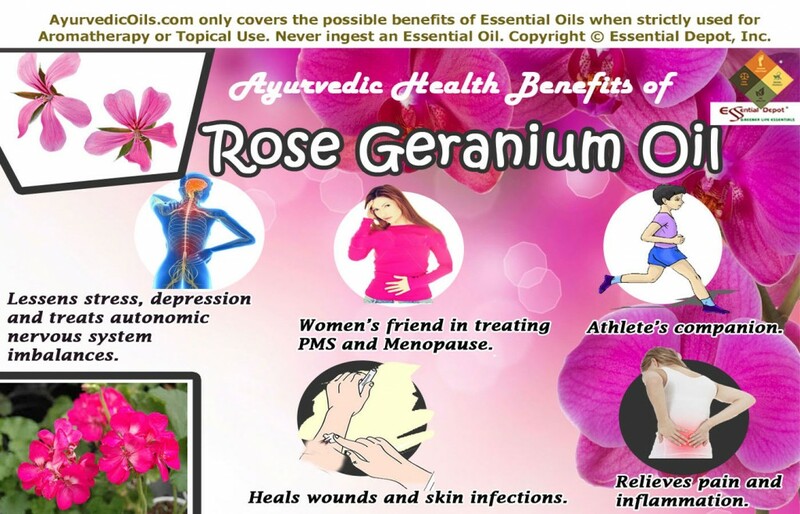 Topical application of Rose Geranium essential oil is known for treating cellulite by fighting against fat metabolism, varicose veins, breast soreness, eczema, psoriasis, broken capillaries, premature symptoms of aging and dermatitis. The anti-fungal, antibacterial and antiseptic properties of this oil makes it effective against acne, ringworm, burns, cuts, wounds and other skin problems. 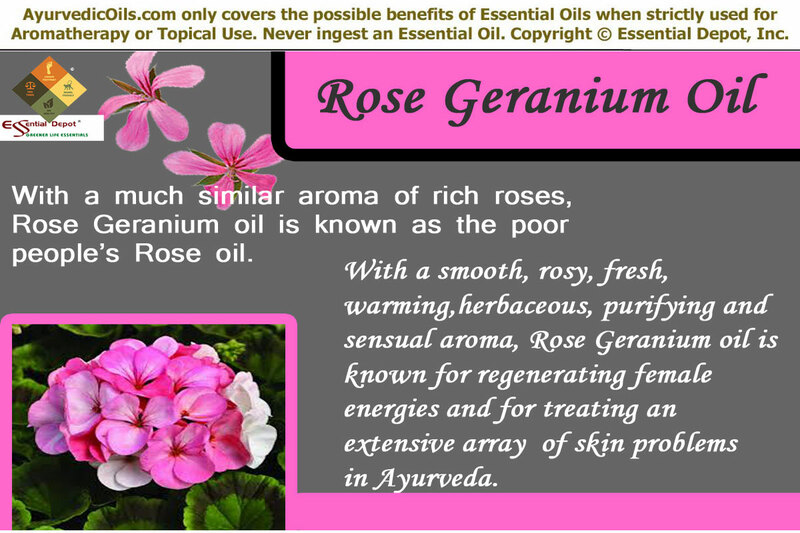 Rose Geranium oil is also used as a diuretic for eliminating toxins through urine in case of fluid retention. It also assists in the treatment of nerve pain, inflammation, shingles, dry cough, nose bleeding, head lice and as an effective insect repellent. Disclaimer: Do not use essential oils directly on your skin as pure essential oils are highly concentrated and might be harmful. Never take essential oils internally without the guidance of your Ayurvedic practitioner. Keep it away from children and avoid using if you are pregnant. This entry was posted in Essential Oils - Learn About and Purchase and tagged autonomic nervous system imbalance, Ayurvedic health benefits of Rose Geranium oil, Ayurvedic oils for athletes, Ayurvedic oils for depression, Ayurvedic oils for skin care, Ayurvedic oils for women, Chemical constituents of Rose Geranium oil, Essential oils for athletes, Essential oils for stress, Health benefits of Rose Geranium Essential oil, Natural remedies for stress, Oils for autonomic nervous system, Rose Geranium Oil, Therapeutic properties of Rose Geranium oil by AyurvedicOils. Bookmark the permalink.